Motogear | Donington SBK. Double win for Badovini in the EVO class! 29 May Donington SBK. Double win for Badovini in the EVO class! It was a difficult weekend for Marco Melandri who, despite qualifying 3rd under the rain of Saturday’s superpole – placed fourth in race 1, and did not finish race two. Marco struggled throughout race one to keep the pace of the first group, but in race two he found a better setting with his Aprilia and was fighting for the podium when he was hit by another rider and suddenly crashed. 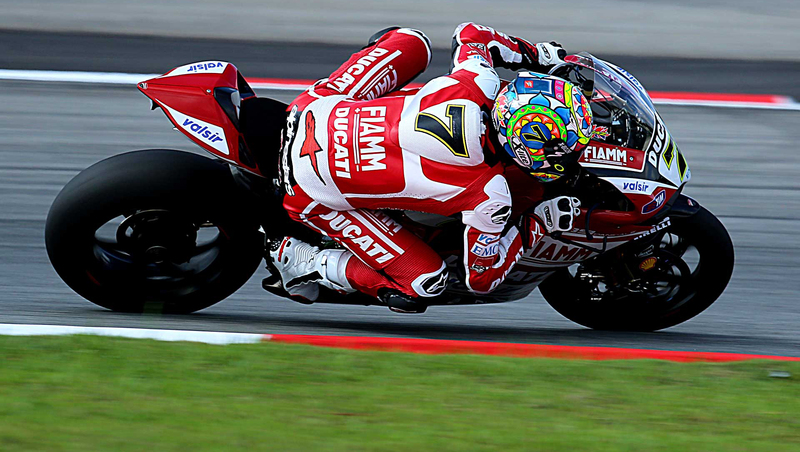 Chaz Davies conquered two fifth places. A very good result for Badovini – winner of the EVO category in both races , but unfortunately, as always, cannot be classified until his bike is homologated. Also Salom, Canepa, Guarnoni and Corti score points.